➡ #70700 LEGO Galaxy Squad Space Swarmer: this set includes a beetle-like alien insect and a Galaxy Squad robot. The alien beetle buzzes around the Galaxy in a beetle-like vehicle and of course the Galaxy Squad tries to terminate it. Two minifigures are included; a robot and alien beetle. ➡ #70701 LEGO Galaxy Squad Swarm Interceptor: here we get a guy named Solomon Blaze, the leader of the Blue Team from pest-control, who is apparently fighting a mosquito-like alien with advanced weapons. Two minifigures are included; Solomon Blaze and alien mosquito. ➡ #70702 LEGO Galaxy Squad Warp Stinger: here Billy Starbeam, leader of the Red Team is dealing with another oversized space-mosquito. It appears that the humans are using robots the help with pest control as the 3 minifigures included are Billy Starbeam, a robot with jet-pack and an alien mosquito with wings. ➡ #70703 LEGO Galaxy Squad Space Mantis: here we have Solomon Blaze fighting a giant space-mantis with the aid of his trusty blue robot. Includes 3 minifigures; Solomon Blaze, blue robot and an alien mantis. ➡ #70704 LEGO Galaxy Squad Vermin Vaporizer: now we are dealing with a serious pest problem; a space-scorpion! The green team has to be called in with Chuck Stonebreaker as the leader. Includes 3 minifigures; Chuck Stonebreaker, green robot and alien scorpion. ➡ #70705 LEGO Galaxy Squad Bug Obliterator: here two members of the Orange Team, Jack Fireblade and Ashlee Starstrider are fighting a giant dragonfly from outer space. Includes 3 minifigures; jack Fireblade, Ashlee Starstrider and alien dragonfly. The picture in the LEGO Club Magazine gives you a good idea about how the insect vehicles and insect minifigs will look like. 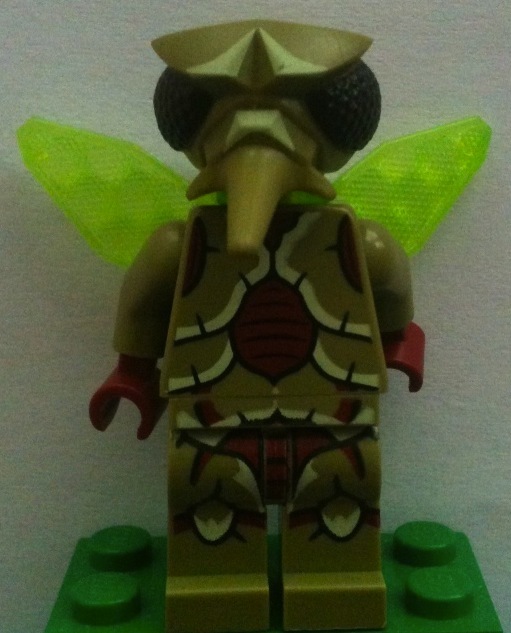 The mosquito above is basically a cross between the LEGO Toy Story Twitch and the LEGO Super Heroes Beetle characters – the other alien minifigs will probably be something similar; minifigs with unique heads-moulds. However there is no picture of the Galaxy Squad as of yet. From the description above it is clear that there are color-coded teams – Red, Blue, Green and Orange – to fight the various insects. There are also robots. Whether these robots will be minifigures or perhaps something brick-built is not known at this point. There is a concept-drawing on Brickshelf that may give a hint, but at this point nothing more is known. Check the above mentioned Brickself folder as there are a few more interesting images. LEGO Train Horizon Express Coming! this looks very interesting. ❓ But I still can’t wait for the ne minifigure parts.. They sound AWESOME. I didn’t know that so much was known about the theme already (I don’t follow that thread), I’m not at all interested in the insect bad guys (in fact, I’m not interested in the theme in general, although, admitidly, the insect wings look interesting and the “exterminatiors” will probably be cool), but I do think it’s nice that LEGO tied it in with MF that way. Apparently, tying Atlantis, PQ, AQ, and Dino together payed off, since LEGO is doing it again! LEGO used to do this a lot more in the past. Look up the 2004 Alpha Team comics, which tied together Alpha Team, World City, Creator (Well, they were called designer sets at the time) and Star Wars. I do like the looks of the concept art work. Unfortunately, it appears they changed the alien vehicles from the highly sought after dark green to the massively overproduced lime green. I love the alien with the numbers 70704 next to him. Hopefully more of the alien designs will be creative like him. It looks very cool. (from what little I have seen. )So, from sea creatures to alien criminals and monsters.Soon will have to deal with insects. What will LEGO think of next. Anyone remember Insectoids? Or am I the only old person here? I have some of the Insectoids (however, I got these long after they were discontinued. ) As we don’t have much in terms of images I don’t know how this will compare with them. As an entomologist I am definitely intrigued by this new theme. I won’t be able to get them all, so I’ll probably pick just the biggest, awesomest, most bug-looking set. Hopefully. Oh yeah I want these. This is What will probably Replace space Marines. Also Lego wouldn’t put a minifigure smoking! Isn’t that the same color as the jump suits for prisoners are?